Must be completed with a passing score by 12/31 each year for it to be accepted by the IRS. How does The Income Tax School compare to other tax schools? Does the IRS regulate tax preparers and do I need to be approved by the IRS to become a tax preparer? What does online mean and how will I know how I am doing? How much time do I have to complete a tax course? Is there a time frame that I need to finish each chapter or assignment? How long will it take to complete a tax course? How much time should I allow for each online lesson? How many chapters should I complete a week? 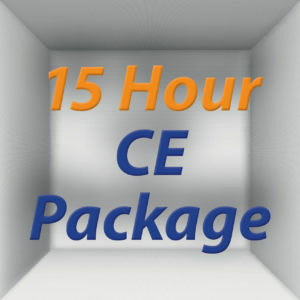 What if I need to exceed the time frame allowed to complete the course? Do I have to buy additional materials and/or books? What do I need to have in order to take an online course, and what are the system requirements? Who will be my instructor? 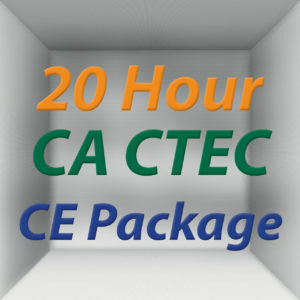 What is the actual response time to have questions answered by the instructor with the courses? I just registered and got my user login. I am excited to get started but was wondering if you recommend I wait for my book? How can I be assured that no one will have access to my course information online? Will I be able to complete an online assignment more than once? What happens if I am unable to complete my online assignment in one sitting? How will I be notified if there is a correction for my online course? Once I complete the course how will I receive my certificate? Do you report my Continuing Education credits to the IRS and/or CTEC? I heard the IRS is now regulating tax return preparers. What does that mean for people new to the industry and those already in the industry? Do the 3-hour seminars have a quiz or test at the end? Where can I find information about the IRS Exam and where I can take the test? Currently, the IRS does not have a mandatory program for tax preparers. 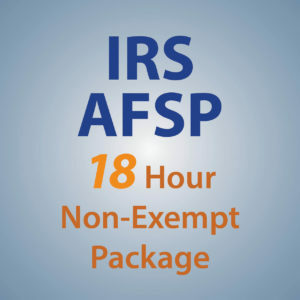 The IRS does have a voluntary Annual Filing Season Program (AFSP) for all unenrolled tax preparers. We recommend that all unenrolled tax preparers complete this program annually. You can learn more about the AFSP at the link below. 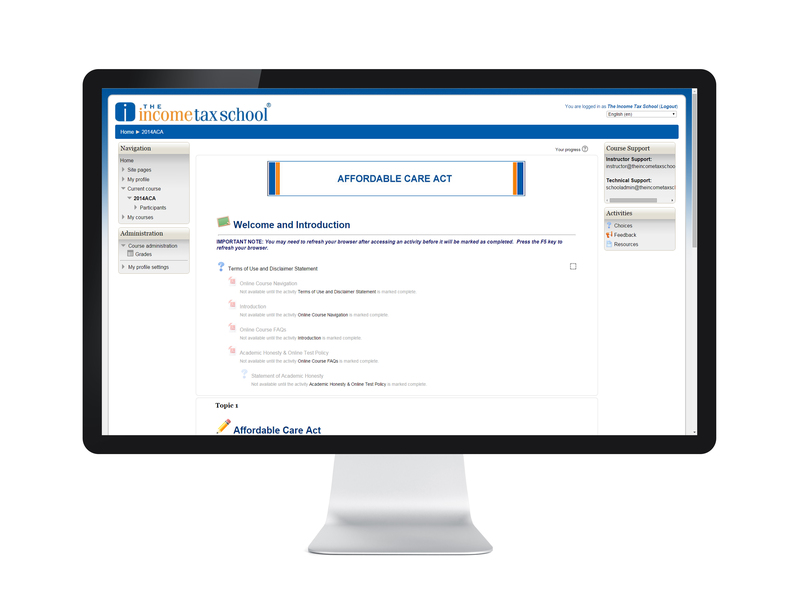 All tax course text material and required reference material is available online with access 24 hours a day, 7 days a week at no additional cost. Purchasing a hard copy of the student text for an additional fee is optional since the chapter PDFs are available online for reading and/or printing. These materials (which include all necessary tax forms on CD for homework, quizzes, etc.) provide students the option to read offline. Hard copies save the students money and time by not having to print the text. For example, the COMPREHENSIVE textbooks have 4 modules with a total of more than 1,000 pages. In addition, the textbook serves as a reference manual for future use when preparing tax returns. The online material will not be available after the course expiration date. Do you report my Continuing Education credits to the IRS? Yes, The Income Tax School is required to report CE completions for the first 3 quarters of the calendar yearonce per quarter. Beginning October 1st, The Income Tax School reports CE completion every 10 days through the end of the calendar year. The Refund Policy below is applicable only for courses students purchase directly from The Income Tax School or Peoples Income Tax School. Students who purchase any courses through third party schools or other organizations must address all refund issues with the entity through which they made that purchase. Please note: Operator©s Starter Kit, License Renewal, Tax Practice Management Manuals (Marketing, Policies and Procedures, Personnel, and Expansion), the Guide to Start and Grow Your Successful Tax Business, and the two Business Start-up Guides are non-refundable.